The popularity of Colombia’s President Ivan Duque has taken a virtually unprecedented nosedive, particularly in the regions where he received most votes in June’s election, according to the latest poll. Duque 53.8% majority approval that was registered by pollster Invamer in September has been cut in half in just two months. Earlier this month, the pollster registered an approval rating of only 27.1%. Almost 65% of Colombians disapprove of the president, whose election in June was marred by election fraud claims. The staggering drop in approval is mainly due to Duque’s lost support in the regions where he obtained most votes, the coffee region that includes Antioquia, the home province of his political patron Alvaro Uribe, and the east of the country. In the coffee region, for example, Duque’s approval went from 68.5% to 26.1%. Along the Pacific coast, which has been submerged in violence, Duque’s disapproval rating hit 74.3%. As far as Colombia Reports was able to verify, Invamer never before registered a drop in presidential approval this steep. Other pollsters that came out earlier indicated a similar downward trend in support for the president’s support, but none as devastating as that of Invamer. Duque took office in August after a divisive and disinformation-laden campaign in which his hard-right and far-right allies accused his opponent of trying to convert Colombia into a second Venezuela, which is undergoing an economic and political crisis. The president, who has no significant executive experience, has made a number of highly unpopular proposals, namely one that would give tax benefits to the country’s tiny and notoriously corrupt elite while increasing the tax burden on the country’s middle class and poor. 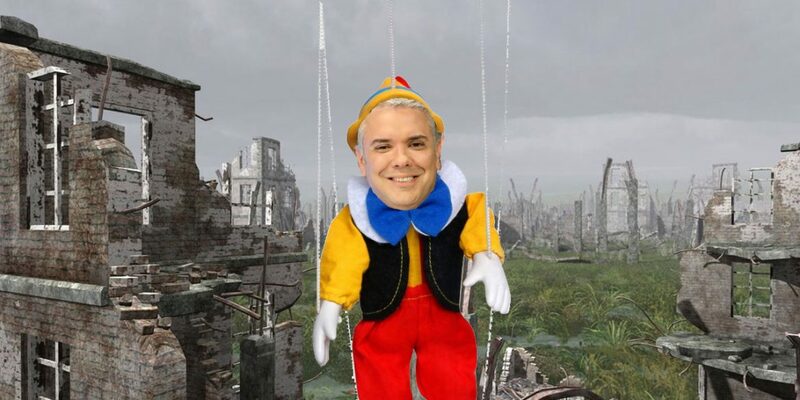 Furthermore, the 43-year-old Duque has been unable to shake allegations he is a puppet president who doesn’t serve the public interest, but the private interests of a small group of political and economical backers, many of whom are associated with war crimes and corruption. Ivan Duque, the mafia’s puppet? From the beginning Duque has claimed to an “extreme centrist,” but — under apparent pressure of Uribe and his radical allies — he has only appointed hard-right and far-right supporters to his cabinet and key positions in important government agencies. The exclusion of moderates in government has reduced Duque’s support in Congress where he is facing strong opposition from the largest leftist and centrist opposition block since the 1991 constitution. While Duque’s party, the hard-right Democratic Center, has been proposing one controversial bill after another, and cabinet members and diplomats appear to ignore the president even exists, Duque increasingly is perceived as a puppet without real power. Meanwhile, violence levels are again soaring throughout Colombia, unemployment is up and public protests led by students are empowering Duque’s already strong opposition on the left.